I started working in travel in 1988. I was originally based in Sawbridgeworth working for an independent company called Travel Places, where I was based for 10 years – the final six of which as manager. Then I moved on to Travel Choice in Welwyn Garden City to be a full-time manager for a year, then after my maternity leave I joined Thomson in Bishops Stortford (then First Choice) as a part-time travel consultant. I stayed there for 16 years until I joined Premier Travel’s Bishops Stortford branch as a travel consultant in July 2015 and haven’t looked back. There’s never a dull moment and I just enjoy making people’s dream holidays come true. I love working with people, and I love the people I work with! I’ve been on city breaks to Paris, Disneyland Paris, Bruges, Amsterdam, Vienna, New York, Munich, Copenhagen and Dublin and I’ve enjoyed holidays to Cornwall, Northern Cyprus, Portugal, Spain, the Canaries and the Balearic Islands (Costa del Sol, Majorca, Menorca, Ibiza, Fuerteventura, Gran Canaria, Tenerife, Lanzarote) Turkey, Eilat (Israel), Cyprus, the Neapolitan Riviera in Italy, Lake Garda and the Greek islands (Corfu, Crete, Kefalonia, Rhodes, Zante, Kos, Skiathos, Halkidiki, Samos, Lesbos). I’ve been skiing in Les Arcs in France and Ellmau in Austria and have been on three Caribbean cruises (St Thomas, Barbados, Antigua, St Lucia, St Martin, St Kitts, Grenada, Guadeloupe, San Juan). Long haul destinations include Sri Lanka, India, Kenya, Mauritius and Florida. I’m off to Villamoura in Portugal with my girlfriends in June; we go every year for a girly escape! It’s ideal for us as we can fly easily from Stansted, and there are lots of lovely bars and restaurants and fantastic hotels. I’d love to do the West Coast of the USA – I want to self-drive down the pacific highway and visit the national parks. I’ve been on lots of beach holidays so I’d like to experience a bit more of the adventure side next. 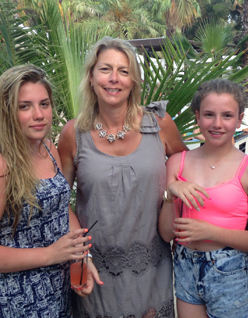 Florida was my favourite family holiday – to see my children having such an amazing time was brilliant. Cruising is my ideal luxury holiday if I was choosing a break for myself! Sharing a chalet with a group of friends and family when skiing in Les Arcs. There were 14 of us and we had such a great time, I’ll always remember it. Always take extra spending money - you can always bring it back if you don’t use it! It’s much more fun to book with Premier Travel! I’ve got so much experience to share, and I’ll look after you from start to finish.